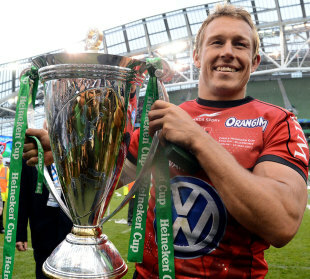 Toulon's Jonny Wilkinson been rewarded for steering his side to the Heineken Cup crown with the ERC European Player of the Year honour. Wilkinson was a key figure in his side's dramatic 16-15 victory over Clermont Auvergne in Dublin on Saturday but his influence stretched far beyond that enthralling Aviva Stadium clash with the fly-half kicking 56 points in the three knock-out matches to round off the successful campaign with a total of 108 points. The 33-year-old was presented with his award, a specially struck gold medal, by ERC chief executive Derek McGrath, at a ceremony following his side's historic first euro triumph. "To receive an award of this importance towards the end of my career is really special. I feel privileged to have been nominated," said Wilkinson. Wilkinson follows in the footsteps of previous winners - Munster's Ronan O'Gara and the Leinster duo of Rob Kearney and Sean O'Brien. Wilkinson was the choice of a judging panel that also shortlisted the Clermont Auvergne trio of Julien Bonnaire, Wesley Fofana and Sitiveni Sivivatu and Leinster's Jamie Heaslip.